Summer is right around the corner and in addition to the awesome Swimming Pool Hacks we shared last week I’ve got a list of the MUST HAVE Swimming Pool Floats for Summer! Everything from Donut Swimming Pool Floats to Pineapple Swimming Pool Floats even Pink Flamingo Drink Holders and more. Bring your Summer Fun A Game with these adorable Pool Floats for Summer! Grab this adorable Pink or Chocolate Swimming Pool Float with Sprinkles, This Ships Free with Amazon Prime! 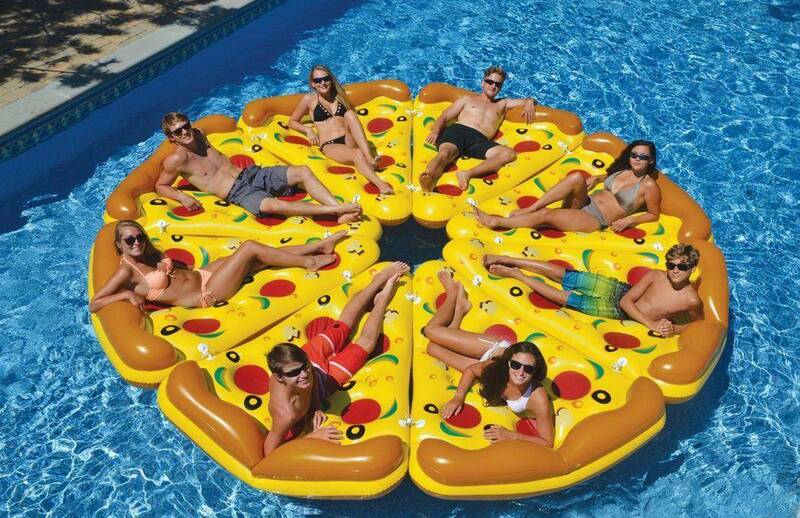 These Giant Pizza Pool Floats will make a full pizza when you put 8 in a circle, Perfect for the lake or lounging in the pool! This Full Size Unicorn would be the hit of the pool and is perfect for lounging in style. This 60″ Inflatable Slice of Lemon, Lime or Orange is the perfect splash of Summer, these are available in 3 different colors, but the one you receive will vary at the time of ordering. Try this Sweet Pool Float for a fun twist on a Lounge Mat. You can grab this 6′ Long Ice Cream Sandwich Pool Float from BigMouth, Inc. This Inflatable Island Lounge Mat is Perfect for floating in the pool and dreaming of the ocean! This is the perfect way to relax in luxury with a Friend. This is a fun way to swim in style with a Friend. This Hammock easily holds 2 Adults and I love that you stay partially in the water so you don’t get too hot! These Inflatable Individual Pink Flamingo Pool Drink Floats are perfect for keeping your drinks above water. Perfect for Lounging in the pool and keeping your drinks water free. Kids of all ages will love this Whale Pool Float that you can grab, this 76″ Float is great for kids of all ages and it’s one of the least expensive options featured on this list. Get a 3 Pack of these Inflatable Palm Island Drink Holder Pool Floats + Free Amazon Prime Shipping, This is the perfect accessory for any Pool Party! This huge Flamingo Pool Float is perfect for lounging in the pool in style, This is one of the most popular Pool Float Styles that people are looking for this year. Keep your Drinks Cold while you swim with this Intex Mega Chill II Floating Cooler. This Cooler Pool Float has 6 Cup Holders and holds up to 72 Cans! These Super Fun Ice Cream Cones come in 3 different colors, colors will vary per set but you get all 3 pieces in one package. This 60″ Delicious Watermelon slice screams Summer and Cool! It’s also the perfect size for lounging in the pool! Grilled Chicken Alfredo Lasagna Recipe! One Pan Roasted Chicken Recipe!